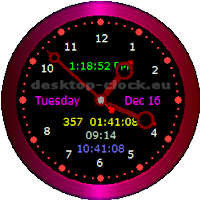 Free Desktop Clock Download from FilesPack.com! Clock was designed as a Windows desktop program. Clock works and looks like a standard clock with extra features.Clock appears while system startup and resides on the desktop.Almost all details of the clock are configurable by the user to suit their own tastes and affects the appearance of other clock windows. The main features include Time Voice Preview (male or female), Daily Planner, Shutdown Pc or Log OFF from Windows at any set time, Countdown to the Future Date, Changeable clock hands and frame, Pc Work Time since system start-up, fifty RSS Channels with timer. You can free download Desktop Clock 1.4 now.